While other Internet Service Providers continue to delay rolling out their Gigabit Internet service, Webpass rolls out a Gig at no cost to its customers. The Webpass team out in the field. Webpass Inc, a San Francisco based Internet Service Provider (ISP) completed the successful deployment of 1 Gig Internet service to 1000 residential customers in California. 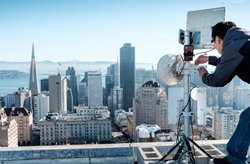 Over the past few weeks, customers in San Francisco, Oakland, Emeryville, Berkeley, and San Diego received email notifications that their Internet service speeds were upgraded to 1 Gig at no additional cost. 1000 Mbps Internet service, commonly referred to as “Gig Internet” or “Gigabit Internet” is the latest buzzword in an industry filled with upstarts and entrenched providers attempting to deliver faster service to customers who are clamoring for it. Almost all of these Internet service providers announced intentions to deliver Gig Internet, however, their timeline to deliver the service remains elusive. At the city government level there is buzz as well about Gigabit Internet service and faster Internet speeds for the city of San Francisco. “Our Internet Franchise Ordinance proposal is the best method to improve Internet connection speeds at the city level so that Gig Internet service is no longer confined to a few cities in the US and to providers offering elusive timelines," committed Mr. Barr. Find out more about Webpass, their Gigabit service, and the Internet Franchise Ordinance proposal at webpass.net.